Ding! Ding! Ding! Julio César Chávez Campeones Now Open for Business in Mesa, Ariz.
MESA, AZ -- (Marketwire) -- 11/10/09 -- After months of anticipation, six-time world boxing champion and Mexican icon Julio César Chávez will open Julio César Chávez Campeones, a one-of-a-kind boxing-themed restaurant and entertainment venue, today, Tues., Nov. 10. Located in Mesa, Ariz., Campeones (Champions) is a 30,000-square-foot venue featuring authentic Mexican food, a full sports bar, arcade games and a World Boxing Council (WBC) Legends of Boxing Museum. In addition, the venue features the Bud Light Doce (12) Events Center for concerts, boxing matches, quinceañeras and community events. The center will be able to accommodate 1,700 people with capacity for another 850 visitors in the restaurant, sports bar and arcade. "The grand opening of Julio César Chávez Campeones is a special moment for me," said Julio César Chávez. "It's very gratifying to have the opportunity to open a place that the Hispanic community can be proud of. I hope that all my fellow countrymen and everyone will join me at this event." Campeones will provide a shot in the arm to the local Phoenix economy. Brian Weymouth, Chávez's agent and business partner in Julio César Chávez Campeones, and team have hired 80 people for the opening, and the venue is projecting revenues of $7-$10 million for the first year of business, which will be a boost for Mesa, the state's third largest metropolitan city. Campeones will be a major attraction for the statewide Hispanic community as well as for tourists from across the U.S. and Mexico. A recent study centered on visitor characteristics and economic impact found that 24 million Mexican visitors visit Arizona annually. "We've received enormous support from everyone in the community for this type of entertainment venue. Julio, one of the world's greatest boxing champions, believes that the incredible number of dedicated fans in the Valley makes Mesa a perfect market for launching Campeones," said Weymouth. In total, $4.5 million has been invested in creating Julio César Chávez Campeones. Key investors include Weymouth, Chávez, Dan Wergin and Brian Day O'Connor. Weymouth is best known for opening Alice Cooper'stown in downtown Phoenix with rock star, Alice Cooper, in the late-90s. He has also worked with sports stars Randy Johnson, Mark Grace and Dan Majerle. Wergin has a background in the wind energy industry and real estate development and Day O'Connor is a veteran in the commercial real estate industry. Weymouth says Campeones will rival and best the impact Hard Rock or the ESPNZone created with the Anglo-American community. Chávez's boxing career spanned 25 years. He is ranked as one of ESPN's 50 greatest boxers of all time and went 90 straight fights without a loss. Chávez retired from professional boxing in 2005. His two sons, Julio César Chávez Jr. and Omar Chávez, now carry on their father's legacy in the ring. 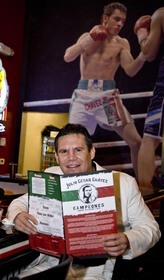 For more information about Julio Cesar Chavez Campeones in Mesa, Arizona visit http://www.juliocesarchavez.net.